Single pill press ZP-5A/7A/9A rotary punching tablet press machine can be made into many pill by using 5/7/9 set of tablet press tooling. Notice: This item is not support PAYPAL and credit card payments, If you have paid, we will refund you and hope for other payment methods. 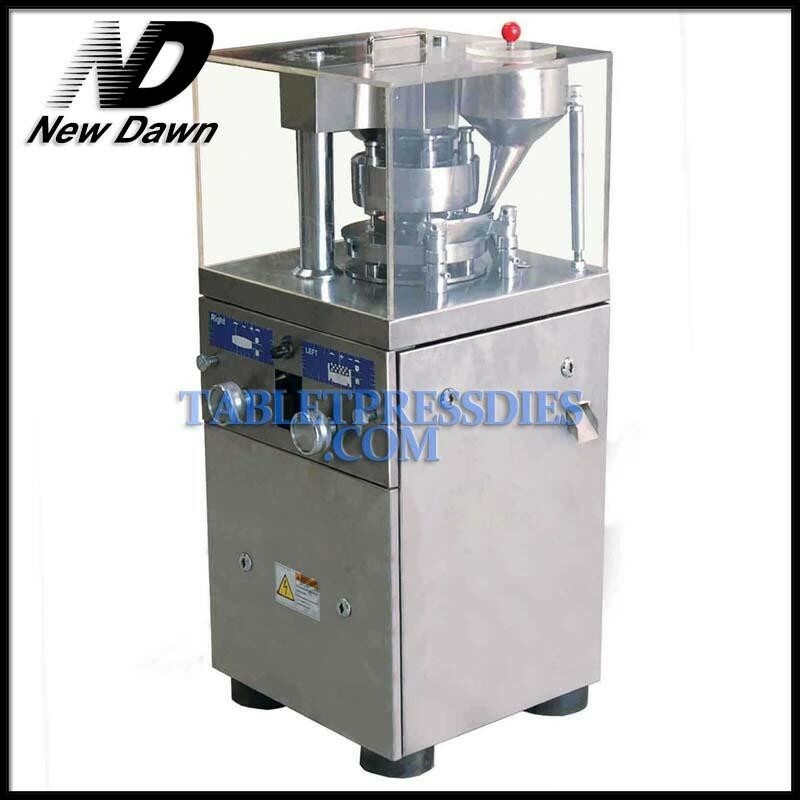 ZP - 9A punching tablet press machine is a single-press type continuous automatic rotary tablet press machine. It can press tablets, coal, sugar, calcium tablets, coffee pills and other granular and powder materials, for pressing various kinds of different shape tablets and plain tablets it is mainly used in pharmaceutical industry & also the chemical, food, electronic industries. 1. The machine is compliance with the GMP requirement on the production of pharmaceuticals. 2. The compression parts is entirely separated from the driving mechanisms. 3. All spare parts to be in contact with the pharmaceuticals are made of stainless steel or the surface being treated specially for non-toxicity & corrosion proof. 4. The compression area is enclosed with transparent organnic glass. To prevent contaminates, the compression area can be specially treated. All surfaces being smooth & easy to clean. 5. Machine speed, the depth of filling the thickness of de tablet could be adjusted. 6. The mechanical buffer unit will prevent punches and apparatus from overload damage. Lubricating oil should be coated in lubricating points and surface every time before operating the press. when finished a batch of production, should take out the remainder powder or grain, and sweeps and cleans the residual powder within any parts in the machine and apply pharmaceutical grade grease. If the press is not in use for more than one week, then should remove the punch and die, and wipe the machine clean up, and apply pharmaceutical grade grease or white lithium grease on the smooth surface of components, then put it in the Container with a cover. 1. It is prohibited to place hands underneath the upper and middle moulds to avoid personal injury. 2. It is required to make materials into particles before tablet pressing based on the technique. 3. The quipment must be fixed to the work table when it on operation.